DD-WRT Forum :: View topic - WNR834B_V2 Bricked? This is how to unbrick it! WNR834B_V2 Bricked? This is how to unbrick it! Posted: Sun Jul 12, 2009 23:32 Post subject: WNR834B_V2 Bricked? This is how to unbrick it! 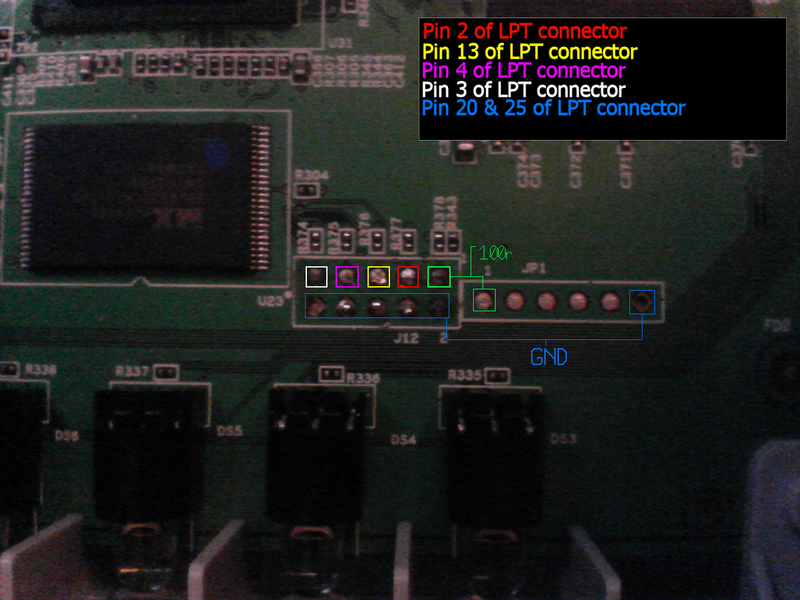 If you get power light orange or all light on, or if you have power light blinking, ttl=100 do a tftp and still the same, than your router is bricked and you need to do the folowing steps. I did this after brick my router for more than 8 times or every time i try to upload old BS firmware. I think wnr834b_V2 dos not like the old BS firmware. There are 2 ways to unbrick this router. The first is not safe but you can try on your on risk. Some times works and some don´t and you may burn your router. 3. short pins 16 and 17 using a small screwdriver on flash chip and plug power. 5. take off the screwdriver and you read to tftp a new firmware. If this dosen´t work, then only TJTAG. Next step is to put a work CFE. power cicle again and now you must have power light blinking, but don´t try to tftp it will not work. power cicle and again you showd have green power light blinking. Now you are read to tftp the netgear firmware. set your IP to fixed. some times is better set your lan card to 10mbs half-duplex. If you get a ttl=100 than you can tftp the netgear firmware. I tryed the newest firmware from Netgear, but after that i can´t upload DD-WRT firmware again. So open another dos windows. On second type tftp -i 192.168.1.1 PUT wnr834bv2_1_0_22_na.bin. Don´t hit enter. Plug power and wait for ttl=100. When router respond ping hit enter on tftp windows. On my took about 7 to 15sec to tftp. After finish, don´t do anything and watch the ping windows. After 2/3 minutes showld respond ttl=64 power light green and lan light (1 or 2 or 3, 4) you are conected solid. If ok, you will get your router back to netgear firmware, and than you can put back dd-wrt.chk firmware using webgui. Sorry for a bad english. Here is a generic custom.bin file that you can edit. There are no characters between the two MAC addresses. Follow Vamp's instructions above for flashing it using tjtag. BTW...I added a link to this thread in the wiki>>install>>wnr834bv2 section for recovering.